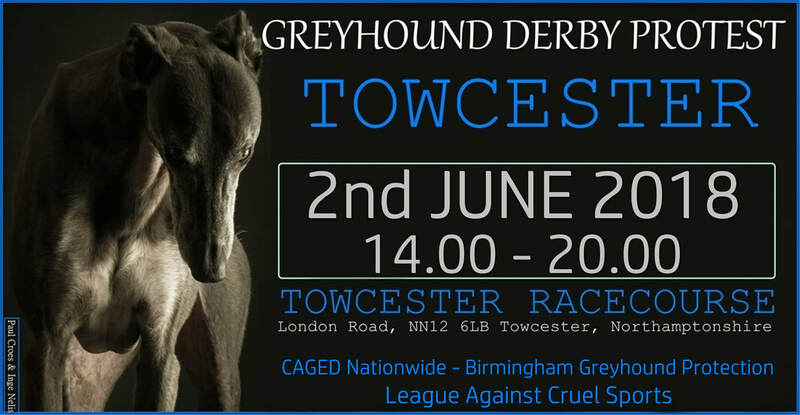 Sadly the "World famous" Greyhound Derby is once again being hosted at Towcester greyhound track for 2018. The winner of the final will be scooping £6000 for every second their dog runs in the race totaling £175.000 for the win, which is part of the £350.000 in prize money throughout the whole event. This money could be better spent saving the lives of thousands of discarded greyhounds every year. It is common knowledge that the running surface at the track is not suitable for any type of racing and injuries are a common occurrence at the track. Caged Nationwide, Birmingham Greyhound Protection & The League Against Cruel Sports are calling on you to offer a few hours of your time to give a much needed voice for the greyhounds that are treated no different than money making machines. This is the biggest race in greyhound racing, so we need the biggest protest to oppose it.